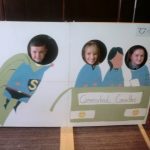 The Green Schools committee is made up of two children from each class from 2nd class to 6th. 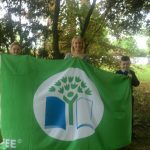 We follow the steps of the Green Schools’ programme to get a flag. We help the environment when we do it and teach the rest of the school about what we learn. We have three flags now, litter & waste, water and energy. We just completed the energy theme and got our flag. It took us three years to get it. We had to do an energy audit on the entire school and come up with ways of reducing our energy use, like reminding teachers and students to turn off appliances and lights, closing windows and blinds, getting advice from experts and monitoring the electricity meter. We managed to reduce the school’s electricity use and oil use and we are very proud. We also had to maintain our other two flags by looking after our litter and waste and keeping our water use down. 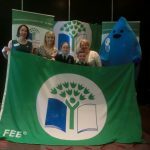 We got our new Green flag at a ceremony in the Radisson Blu in Little Island on the 16th of May and we are going to have a flag raising ceremony on the 21st of June.